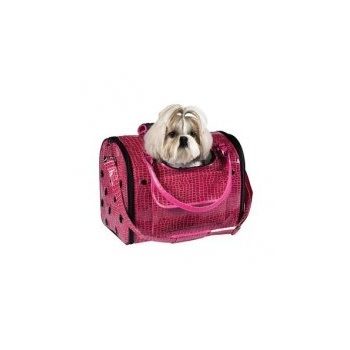 One of our most popular carriers, the Zack & Zoey Croco Pet Carrier features embossed crocodile texture for fashionable, yet functional traveling. Fashionable faux-crocodile look in Pink with rhinestone-studded bone charm accent. Top mesh and side grommets for proper ventilation. Easy-care removable sherpa mat with interior clip for safety and comfort. Front and side pockets for convenient storage. Small: Holds pets up to 15 lbs. Measures 12.5" x 7.5" x 10"